The 6502 processor Eurocard (100 x 160 mm) has crystal control, 1K bytes of RAM and 512 bytes PROM containing a system monitor. A second Eurocard is mounted above it using pillars and the two are connected by ribbon cable. The top card has a click-action 25-key hexadecimal keyboard and an eight digit seven-segment LED display. The system monitor contained in two fusible link ROMs (74S571) is very easy to use and provides the following facilities using one of the 8154 devices as a keyboard interface and display driver. BREAK POINT INSERT/REMOVE allows setting and cancellation of break point anywhere. SAVE TO TAPE - transfers mary contents betwaen given locations on the tape. LOAD FROM TAPE - loads data into locations specified by the first two bytes on tape. The monitor also includes a character font for seven sent representation of the complete ASCII character set. The system 1 is provided with a users manual which includes an introduction to binary numbers, descriptions of the 6502 internal architecture and Acorn hardware, a listing and explanation of the instruction set and monitor program and a step by step introduction to machine code programming complemented by 16 original applications programs. Provides the basis for the addition of more Eurocards. The system 2 contained within a 19" card frame consists of the following Eurocards all of which are described individually in this catalogue. This is a crystal 6502 processor card, with a 2K byte Cassette Operating System (COS) and a keyboard interface. 40 column x 25 lines, 8 colours including black and white. The COS provides drivers for display of text and graphics and hardware scrolling. Carries 4K bytes of RAM (a further 4K may be added) and the 4K BASIC ROM. A second ROM containing a floating point package and scientific functions may be added. Customers may specify CU-MEM as an alternative to this memory card, at no extra cost. Using this board, programs and data may be stored on an audio cassette recorder. The four boards are connected in the card frame using an 8-slot backplane with two-part Eurocard DIN connectors. Please note that a keyboard is usually required for this system. Printers and TV monitors suitable for this system are listed elsewhere in this catalogue. The system 3 in its minimum form is a system driving a single disk. The hardware consists of a card frame, backplane with 4 sockets, 6502 CPU, VDU interface, 8K RAM, floppy disk module, DOS (Disk Operating System) and resident 4K BASIC. The mini floppy disk drive is mounted in a 7" module together with its controller card and provides approximately lOOK bytes of storage. A DOS ROM on the CPU card controls the drive and handles files and input/output eg: the parallel ASCII keyboard and matury mapped VDU. Software may be loaded from disk or contained on ROM. /All /the Acorn Eurocards are compatible with this configuration allowing enormous variations on a modular basis. The illustration above shows the addition of a further 3 RAM cards (giving 32K bytes of mainry in total) and a versatile interface board. Please note that a keyboard is usually required for this system. Printers and TV monitors suitable for this system are listed in sections 10 and 11. Customers may specify CU-MEM in place of Acorn 8K RAM cards for use in these systems at no extra cost. The system 4A is housed in a double height rack with capacity for up to 14 Eurocards. The minimum system has as standard two floppy disk drives, power supplies, card frame buffered 14 slot backplane 6502 CPU, VDU interface, 16K RAM and disk controller. A DOS(Disk Operating System) controls both disk drives and a disk with utilities programs including disk copy is supplied with each system. Customers may specify CU-MEM in place of the Acorn 8K RAM card at no extra cost. The system illustrated has the additional audio cassette interface, 32K bytes of RAM and serial and parallel interfaces using the versatile interface board. The Econet communications network system was developed by Acorn to enable a number of Atoms and/or other systems to communicate with one another and to share facilities such as disks and printers. All stations have equal status and, unless specifically prohibited, any station may communicate with any other without recourse to an intermediary. The Only unique station is the one that generates the network clock, but this may be an Atom or larger system. 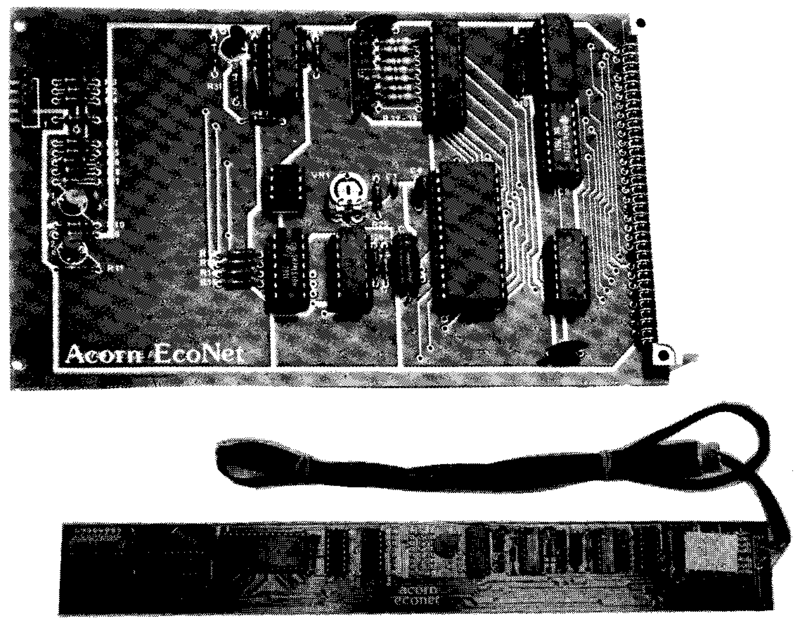 The Econet Eurocard is the system version of the Econet interface card that fits into the Atom computer. It plugs into the backplane and carries the ROM with the low level Econet software to allow the host system to be linked to other Acorn products. The Econet Interface for the Atom is specially shaped to fit inside the Atom case, using connectors already provided. The 4K Econet ROM is plugged into the expansion ROM socket at hex A000. Up to 255 stations per Econet. Econets may be joined together by Gateways. Connection by 4-wire cable to each station. Station separation up to 1 kilometre. Data transfer rate up to 210 kilobaud. Differential signals for high noise-immunity and minimal radiation. Clash detect circuitry, collision-arbitration algorithm minimise need for retries. Econet executed automatically on BRK. The Acorn COS is designed for use with system 2. It is supplied as a 2K ROM which provides operating vectors, keyboard, 40 column video and printer driver software. It provides a tape mass storage system using a domestic cassette recorder and the CUTS recording system. (Computer Users Tape Standard), and relies on the Cassette Interface, which is described in its own section in this catalogue, page 3.3. Acorn system BASIC is configured in two sections. The 4K integer BASIC provides the general purpose routines for line numbering, subroutines, input and output to and from keyboard, video, printer, disk, tape etc., integer arithmetic and string handling. Any command not understood by integer BASIC is referred to the BASIC extension. Two versions of the extension are available. Floating point BASIC extension provides floating point arithmetic to nine significant figures, trigonometrical and exponential functions, graphics and numerical evaluation of a string. ONLI extension to BASIC is also available, as an alternative to floating point. ONLI is short for ON-LINE and is designed for real-time applications involving timers and input and output channels such as in machine control or experiments. 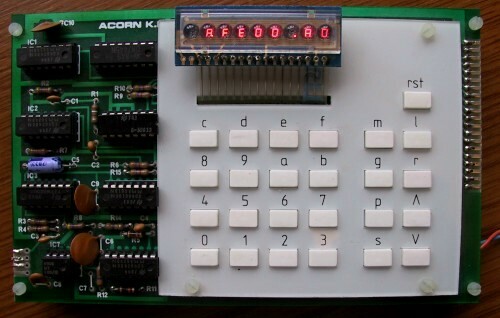 Acorn Atom BASIC is available for use in a 6K version for system 3 and 4, and in a 10K version for CUBIT systems operating under CUBOS. The 6K version offers dimension statements and a machine code assembler as an alternative to the floating point extension, and the 10K version offers these facilities in addition to the floating point extension. This 4K software provides a wide range of facilities for two pass 6502 machine code assembly. It is most suitable for disk systems and makes extensive use of the advantages offered by disks. Features include labels, arithmetic, disassembly, and linked files. This 4K software package allows the creation of text files, which can be saved and loaded with tape or disk, and can be output to a printer with a variety of formatting commands, includes right hand text justification, and control of the printer to modify print styles. Editing facilities allow the fast location and altering of one or more defined strings anywhere in the text.